September 29, 2013 Senior Al-Azhar scholars have lashed out at influential Muslim cleric Yusuf Al-Qaradawi for his pro-Muslim Brotherhood statements, with some calling for prosecuting him for ‘high treason,’ according to Ahram Daily. ‘His inflammatory fatwas [edicts]would be considered under any constitution and law to be high treason, and could lead to the individual being stripped of their nationality,’ said Ahmed Karima, Islamic Sharia professor. Islamic scholars are not alone in taking issue with the prominent sheikh. Some political activists have also condemned his ‘rabble-rousing’ speeches. ‘He continues to incite violence and murder in his sermons against police, army and the people, proving allegations that he serves foreign agendas,’ said Mohamed Moussa of the Conference Party. 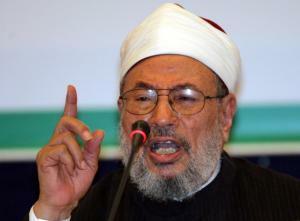 Abbas Shoman, under-secretary of Al-Azhar – the highest institutional authority in Sunni Islam, has hit out at Qaradawi for what he has termed ‘hysterical’ statements calling for intervention from the West following Morsi’s overthrow and in response to the interim-government’s recent crackdown on Islamists. Many of Al-Azhar’s scholars have urged excluding the controversial cleric from the institution’s Senior Scholars Authority. Qaradawi, one of the most prominent Egyptian Sunni academics in modern history, who chairs the International Union of Muslim Scholars, has recently come under fire for backing toppled Egyptian president Mohamed Morsi and the Muslim Brotherhood, as well as his perceived sedition against Egypt’s army and police. Hundreds have been killed in bitter political unrest, pitting Islamists against Morsi’s opponents and security forces. Al-Azhar is located in Cairo and the Al-Azhar University is one of the oldest educational institutions in the Islamic world. In July 2008, we reported that Qaradawi had been elected to the Al-Azhar Islamic Research Council. Youssef Qaradawi is the most important leader of the Global Muslim Brotherhood and is the de facto spiritual leader of the movement. He is also considered to be the “spiritual guide” for Hamas and his fatwas in support of suicide bombings against Israeli citizens were utilized by Hamas to justify their operations. In 2004, Qaradawi turned down the offer to head he Egyptian Brotherhood after the death of the Supreme Guide. He is based in Qatar and has said the Qatari Emir has protected from being designated as a terrorist by the U.S. He has also reportedly amassed substantial wealth by serving as the Shari’ah adviser to many important Islamic banks and funds. Qaradawi is the head of the Union of Good (UOG), a worldwide coalition of charities helping to raise funds for Hamas and is the leader of the European Council for Fatwa and Research (ECFR), the theological body of the European Muslim Brotherhood. MEMRI has produced two video compilations of Qaradawi’s extremist statements. The first collection contains Qaradawi’s statements about Europe and the US as well as about Israel and Jews. The second collection contains various statements by Qaradawi on social issues such as discussing the killing of homosexuals and stating that beating is “suitable” for some wives. Qaradawi been banned from entering the US since 1999 and UK since 2008. Last year, authorities also refused him entry into France. Last month, the GMBDW reported that Egypt’s chief prosecutor had issued an arrest warrant for Qaradawi who was accused of inciting the killing of Egyptian security forces and meddling in the country’s affairs. The same report also noted that Qaradawi was asked to leave Kuwait as a result of were been described as “divisive remarks he has made inciting violence and bloodshed.